The South Carolina Confederate Relic Room and Military Museum is a high-quality, award winning educational resource for the state’s students, educators, and parents. Our free tours, programs, and curriculum contributions benefit and reinforce education goals statewide. The museum’s exhibits are keyed to the state standards in history and Social Studies. Military history is not just the story of men on the battlefield, but of the overall experience of war, including homefront hardships, economic concerns, and the role of technology. A free tour at our museum brings the study of history alive for students of all ages! Over the past few years, we have broadened our teacher outreach programs, providing free in-service training meeting space, as well as instruction on military history. We are also involved in SC curriculum developments, providing images and information for textbooks. In 2008, the museum received two awards from the South Carolina Council for the Social Studies, given out at its annual conference: “Program of Excellence” for the year, and a special “Friend of Social Studies” award honoring our overall contributions. Homeschoolers, like the state’s public and private school educators, recognize and appreciate the museum’s unique resources and the quality, creativity, and excellent educational value of our programs. Our free Home School Friday history lessons and activities remain highly popular among area homeschoolers. 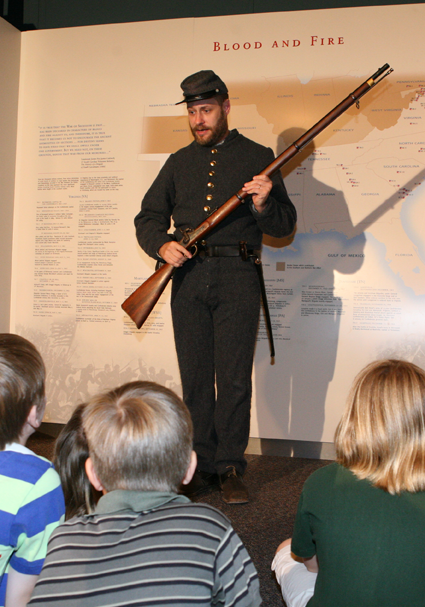 Discover the educational possibilities of the SC Confederate Relic Room and Military Museum for yourself! Below is a listing of several services and resources available for educators and parents. For more information, contact Joe Long, Curator of Education, via email or call 803-737-8095. World War I Exhibit and All Quiet on the Western Front English Lesson Plan - This lesson plan is designed to be used in conjunction with the novel by Erich Remarque, after a tour of the SC Confederate Relic Room & Military Museum’s First World War exhibit, “Forgotten Stories: SC Fights the Great War.” The following material can be used to supplement this activity: WWI Images.